Hi, I like a lot what I’m seeing in those screenshots, really. I might even try to copy some ideas for konqueror. But there just only one little thing I’d like to brought attention about and it’s the code coloring for syntax highlighting: having so many colors distracts the developer: I start to see colored glyphs instead of lines of code, and when I try to read something the color gets in the way, my brain can’t help it: when processing the input of my eyes, it processes so much color information that the code itself is more difficult to process. I know that the coloring is an easy way in katepart to tell the user that the parser is very advanced and thus can tell the difference about a lot tokens, I developed coloring support for a language, I added support for syntax highlting for LEA, see http://www.flickr.com/photos/17901580@N00/14917989/sizes/o/ . Too many colors there too. I suggest you take current kate syntax highlighting colors for C/C++ as a base, it gets less in the way for the developer. Then maybe use shades of gray for distinguishing vars from types and that’s it, italics and bold, etc. This is some seriously awesome stuff you are doing. Thanks wo all the KDevelop developers for thair hard work. Can’t wait for KDevelop 4 to be released. BTW, wouldn’t it be more consistent to name Areas as Activities, at least the concept is very similar, if not the same, as Activities in Plasma. @edulix: You can shut all the additional highlighting off in the options. You can also tune it to the intensity level you like best. But as a regular user, fact is, it _helps_ you reading the code. Even if it is a lot of color, but it contains information,. At first I was also put off by that much color simply because I was used to coloring systems similar to kate or vim, but after a while I really started liking it. It helps you so much in reading code and getting information e.g. is a variable a local variable, a member variable or a member of the parent-class all this with just a glimpse at the color. @zwabel I have not found a setting for it but it would be great to be able to specify in which way new functions/methods get added, so far it is e.g. I know that is nitpicking to some degree, but that only shows how far you (as KDevelop team) have got. I hope the oxygen guys can churn out some awesome icons for this, not too far into the future. KDevelop has so many killer features now, it’s a dream to use (except when it crashes, but I guess that will be less of an issue now that you’re moving into that mini-freeze). duchains is an extremely good concept, and fantastically executed, imho, I’m seriously addicted. Only question I have is if the custom highlighting stuff looks OK with other widget styles and color schemes? Its really amazing to see such an effective UI focus put into practice. Many kudos’. hello, I was wondering how integration of php and hacking on websites in general fits into this scheme .. since it seems quanta is waiting on KDevelop for some things. 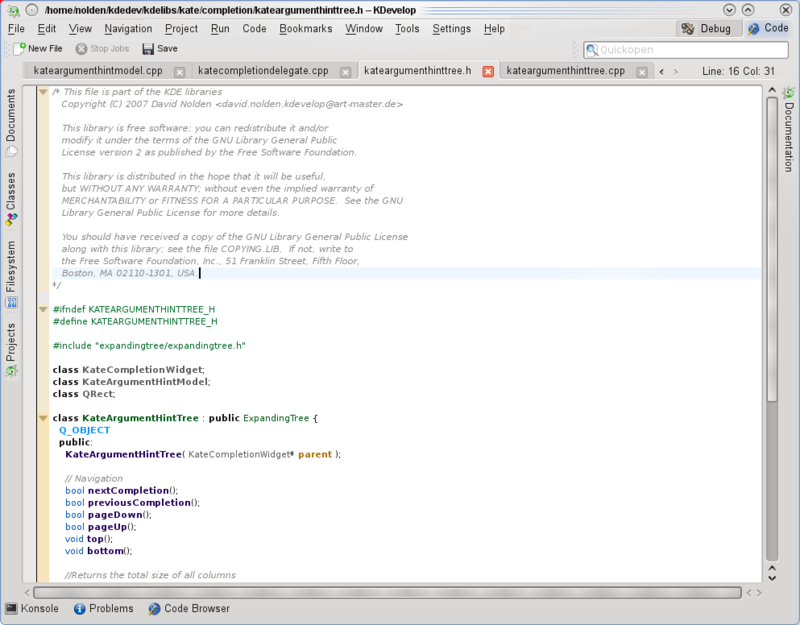 But you can use KDevelop with the php plugin from playground. Yes the new UI seems really clear, and don’t use too much space. I know you won’t like this, but it’s looking more and more like Eclipse :). But from an eclipse lover like me, this is a great compliment. Now it’s time to focus on an awesome 4.0 release ! If you publish the mockups/screenshots in the future, try without the default toolbar. The [new] [save] [undo] etc. bar takes up a lot of space and makes the UI look wasteful of space. Moreover, the tabs for documents and spaces will be visually more connected (closer) which will help bring across the concept. Even the novice computer user will use Ctrl-N / Ctrl-S / Ctrl-Z for this. @sandsmark: Custom highlighting works with other window color schemes, but still has problem if the kate color-scheme does not match the window color scheme. @mat69: Everything is mangled through the currently active source code formatter before it is inserted. So if you can convince astyle to do it the way you want, it will work. Otherwise, I think we need support for the ‘uncrustify’ formatter, as that one seems to have much more options. @Snirp: I hope most of those actions by default will be replaced with really useful stuff. I’d agree on putting the ‘&’ or ‘*’ sign on the right side, because the C++ compiler treats the ‘&’ and ‘*’ symbols in the a different way. int *x, y; // more obvious that x is only a pointer really. Personally, I don’t like the second variant. Yes, if there is multiple variable-declarations in one line, then it makes sense. But else, putting the ‘*’ to the left side is imo nicer, because it is a nice “TYPE name” splitup, not “TYPE TYPEname”. Very nice, but we need Python support. If KDevelop keeps evolving at this rate I’ll probably even switch from Eclipse do KDevelop for my C++ programming and only use Eclipse for Java. What happens when you shrink the window, or have more than a couple of working sets? Where do the icons go? There’s only just enough room for them in your mockups/screenshots. I’ve found myself wanting features like this in kate. Its starting to be a little too simple to work cleanly with some of my projects. I might have to give KDevelop another try! Still looking great – how’s visual debugging support coming along? I seem to recall that was one of the key outstanding items a couple of months ago. @tom Lynch: There is a lot of work being done on the debugger these days (Mainly by Niko Sam), it seems to be coming along nicely. Hi, just wanna say thanks for your work. I am beginning to pick up c++ on kdevelop 4 but find it difficult to start to code a simple “hello world”. I just want to type sample code from my c++ book, but some how the simple (console) project templates are missing. Us “novice” programmers want to learn the language first, and then worry about cmake, qmake or autotools… Any easy way to do this in kdevelop 4? Very nice. Are the Working Sets fixed categories? I tend to edit in sets more like lib, cli, gui for some of my applications, and yet other categories for other applications. It’s not clear if I can define my own sets with this new interface. Heck, I’d toss in a scratch documentation and website set as well so as I’m working I can note certain changes. @Kombat: Either find some tutorial how to create a hello-word Makefile or cmake project. cmake is not complicated, a hello-world project would just look something like “TARGET(helloworld, main.cpp)” and not much more. Actually KDevelop has a “No GUI (Cmake)” template, that probably is exactly what you want, a hello-world command line application. @JabberWokky: The working sets are automatically defined by the files you have open. Every set of open files automatically is a working set. I hope it will integrated in the major distribution including KDE4.3, it seems to become really amesome ! KDevelop4 is such a step up from KDevelop3, it’s amazing to see all the new features. I just hope the project management bits gets worked out soon, so I can start using it for real. I really like the working set idea. I have a little problem with the tooltip dialog though. I think that the “hover to get a dialog” mechanism breaks the GUI consistency with the rest of KDE. Hovering over a component usually only gives a small informative text, which goes away when the mouse leaves the GUI component. Redefining how tooltips works is a bad idea, consistency-wise. The relatively complex code view tooltips when hovering over the syntax elements are a stretch, but I think they are ok given that they are _mostly_ informative. I’m not sure you actually need to ‘manage’ the working sets very much. When a file is opened its view is automatically added to the current working set. When the view is closed it is removed from the current ws. All you really need are buttons to add and remove working sets. The working set icon besides the document tab bar could be a drop-down button instead, similar to the forward and back buttons in konqueror, i.e. when you hold it down for a second a small menu appears that allows you to create a new working set or delete the current. There is no need to show what files are part of the working set, you see that in the document tab bar anyway. I don’t think the “Add all” and “Subtract all” are needed either, just open or close the files you want in a ws. Could you please describe what exactly these Areas do? Especially maybe post a screenshot of a Debug area? Because if they are even remotely associated with Eclipse Perspectives, I smell disaster. 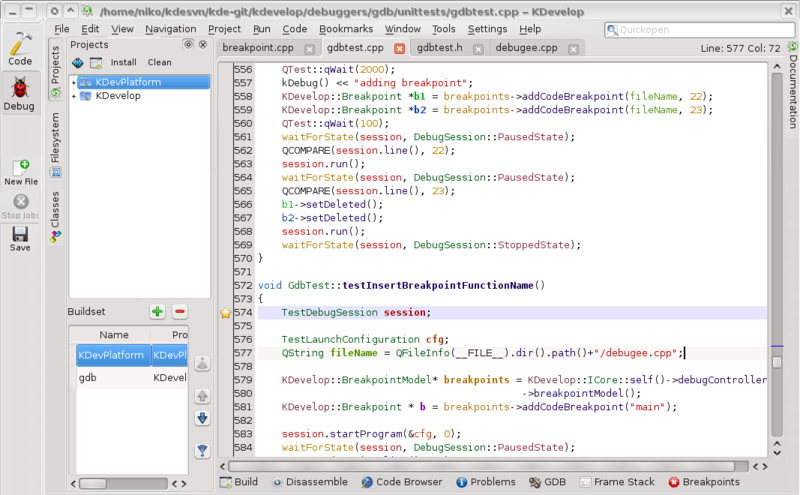 Eclipse Perspectives completely change your working area, and are the worst thing anyone could do in an IDE. Give me a good code view area with an ability to debug on the spot – I’ll take it over Perspectives any time. Actually, Perspectives are one of the reasons I hate Eclipse (the others are it being sloooow and having a worst possible UI on the planet. For example, the right-click menu is 700 pixels high and contains ~40 entries, half of them submenus, copy/paste being somewhere in the middle, with even “Preferences” being there, wth?). same problem as the other guy wanting to start learning on kdevelop and c++. I have spent 2 days trying figure out how compile and run hello world. other ide’s are intuitive and straight forward. I can find no where or way to write even my most simple source files to begin using kdevelop to build upon as a new programmer. using codeblocks now.. but I rather be using kdevelop.